An excerpt from the finale of Rossini’s Stabat Mater, performed by the Dublin County Choir at the National Concert Hall in Spring 2010. The choir makes regular excursions into lighter repertoire – Fernando is from a National Concert Hall programme in 2009 in which the Dublin County Choir featured the music of Abba, Queen and the Beach Boys. ‘Blessed are the men who fear him’ from Mendelssohn’s Elijah – a chance for some gentle singing. The video clip below was taken during a rehearsal with the Serenata Orchestra in St Tiernan’s School in 2010. That was the preparation of the World Premiere of the work: Mórann m’Anam an Tiarna, a Magnificat set in Irish by Brian Ingoldsby. We are very proud to have Brian as a member. 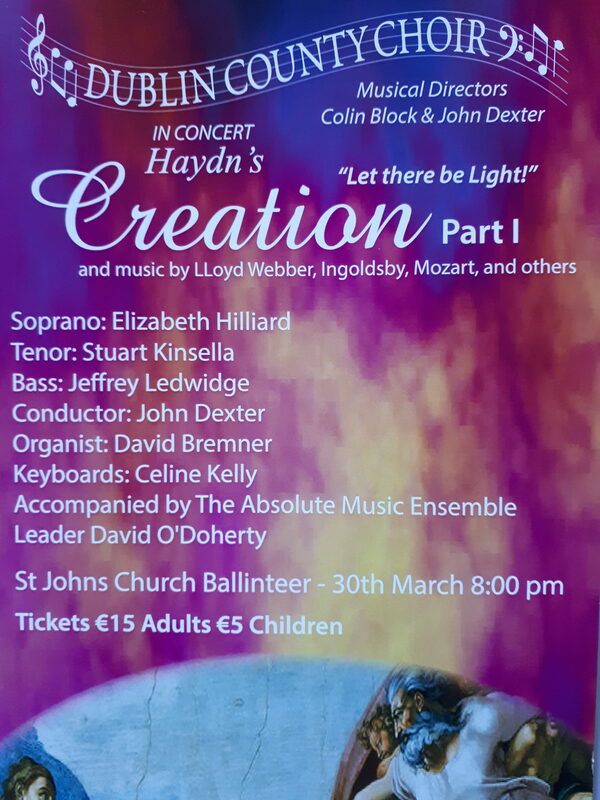 Magnificat was given its second performance on May 18, 2013 in the National Concert Hall.